The holiday season often bring two things — out-of-town guests and a deep desire for peace. With that in mind, Chestnut Hill Friends Meeting (CHFM) has added extra viewing dates for its James Turrell Skyspace installation. Turrell’s site-specific work, “Greeting The Light,” is the focal point inside CHFM’s new meetinghouse and his 76th Skyspace. Winter means that regular opening dates for the Skyspace will be reduced to just Sunday evenings. But visitors from outside the area are usually already heading home by then. CHFM wanted to give folks who are visiting local friends and family during the holidays the opportunity to take in and share the experience. “We hope people can get a chance to see it. We did it so people could see it,” says Signe Wilkinson, CHFM’s Skyspace host. The Skyspace is a rectangular oculus in a 36-foot vaulted ceiling, calibrated in such a way that it gives the appearance of a floating plane. It opens to the sky via a motorized retractable roof. Along the base of the ceiling, housed in a cove, a system of programmed LED lights interact with the changing light of dawn and dusk skies. Unlike a traditional holiday light show, the Skyspace experience is slow and subtle. Local art educator Stuart Shils says he has found the Skyspace to be a refuge amidst the climate of a hectic, often assaulting, every day world of ceaseless expectations. “I need [Turrell’s] art and the depth of his illumination as a way of returning to what really matters — the serene and permeating presence of light and color,” says Shils. In September, Turrell was awarded the National Medal of Arts, the highest award bestowed upon artists by the U.S. government. 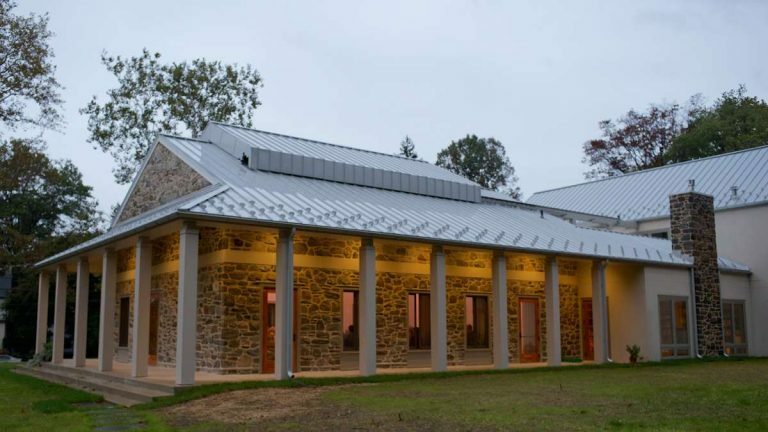 Last month marked the one year anniversary of CHFM’s new meetinghouse following a decade of deliberations on the design, years of fundraising and months of construction setbacks, including a vicious arson attack. Ten members of Local Ironworkers 401 have been charged in connection with the December 2012 crime. Since opening its doors to the general public, the Skyspace has attracted over 3,800 visitors, some from as far away as New Zealand. A few weddings and concerts have also taken place under the installation. CHFM has acknowledged that raising money to build the new meetinghouse could not have happened without the Skyspace. That, in turn, has led to a greater ability to serve the local community, from hosting homeless families to being the polling place for three sections of the 9th Ward. “Our mission is not to bring art to the world, but it has allowed us to be useful in ways we never could be before,” says Wilkinson. Since the Skyspace opens directly to the sky and elements, the added dates are contingent upon the weather conditions. Openings will only occur if there is no precipitation and outdoor temperatures are above 40 degrees. Thanksgiving morning, Nov. 27: sun rises at 6:09 a.m.Black Friday evening, Nov. 28: sun sets at 4:37 p.m.Christmas Eve, Dec. 24: sun sets at 4:40 p.m.New Year’s Eve, Dec. 31: sun sets at 4:45 p.m.New Year’s Day morning, Jan. 1: sun rises at 6:32 a.m. Guests should plan on arriving fifteen minutes early and are reminded to bundle up in warm weather attire.